An utterly daft though watchable 1998 slasher film, Urban Legend was one of a number of nineties horror movies that attempted to carve a slice of the market in the wake of the ground-breaking Scream. That movie was of course directed by genre maestro Wes Craven and featured a brilliantly witty, self-aware script by Kevin Williamson; Urban Legend doesn't quite have same credentials going for it. On a university college campus, a series of gruesome murders committed by an axe-wielding maniac wearing a parka appear to draw inspiration from famous spooky tales, such as the serial killer lurking in the back seat of the car. Who is the culprit? And what is their motive? With the clichés piling up as fast as the bodies (characters seemingly able to teleport from one area to another; unrelated people wearing exactly the same clothes as the killer), there's no denying that Urban Legend is utter tripe, although it does feature the odd creepily effective set-piece. Besides the casting of eventual Dallas Buyers Club Oscar winner Jared Leto (there's also a knowing appearance from Halloween 4's Danielle Harris), the most memorable aspect of the movie is the grandiose and powerful score from composer Christopher Young, one that serves to ramp up the tension and make the movie more compelling than it would otherwise have been. In other words: a classic horror soundtrack. Although Young is one of the most versatile composers in the business, having turned his hand to moving dramas (Murder in the First; The Hurricane) and funky jazz (Rounders; The Rum Diary), he's forever destined to be remembered as one of the industry's pre-eminent horror scorers. A self-confessed fan of darker musical textures, Young has always shown a fondness for horrific material from the likes of Invaders from Mars and Hellraiser in the 1980s to the explosive Drag Me to Hell. One of the reasons why the composer's horror music is so enduring and popular is its thematic quality, never descending into aimless noise and always centering on memorable musical ideas that follow a clear emotional narrative, although the recent, non-melodic likes of Sinister have seen the composer entering the more abstract realm of sound design. Urban Legend belongs squarely in the former camp. 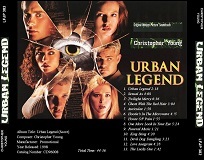 The opening "Urban Legend" immediately sets an air of foreboding with its breathy, eerie female choir (reminiscent of Young's very own Species) and deceptively tranquil piano/flute undercurrent – like all great campfire tales, it has an appealingly creepy nature that draws one in. The composer then ruthlessly builds the tension even further in the score's first "stalk and slash" cue "Sexual Ax", Young's enjoyably muscular and grandiose flair for scary writing coming to the fore as stabbing strings and shrill woodwinds mix with a harsh brass onslaught that's challenging but also listenable and exciting. The composer has always had an excellent rhythmic sense, no doubt honed from his early days as a jazz drummer in Los Angeles, and that craft serves him well here. During the same track, Young introduces one of the score's most effective and unnerving techniques in the form of a metallic percussion rhythm, as unstoppable and merciless as the killer themselves and one that will work its way through following cues "Auriculae", "Hootie's in the Microwave", "House of Pain", "One More Look in Your Eye" and "Devil Dog Dangling". One senses the composer drawing from the same musical well as Marco Beltrami's influential Scream score, a soundtrack that unleashed a far more extravagant and operatic kind of horror score upon the slasher movie universe. However, there's no denying that the tone of Urban Legend is all Young: the spine-tingling, descending choral textures in "Devil Dog Dangling" for example could have come from either of his two iconic Hellraiser scores. And the wickedly malevolent tone is also a hallmark of the composer's, extending right the way through to more recent works like the awe-inspiring Priest. The score calms down but chills the blood with the slow-burning "Twilight Mercy", melding ghostly voices with some surprisingly emotional strings, Young again utilising the main theme (this time in more of a propulsive, urgent context) and teasing at the identity of the killer. "Ghost with the Red Hair" offsets harsh orchestral jabs with cold piano work and a chilly sense of dread from the string section whilst "Funeral Music" again plays around with variations on the main theme. 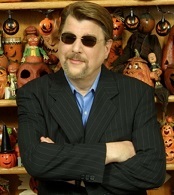 Other memorable textural ideas include the uncomfortable acoustic effects at the end of "Hootie's in the Microwave" that simulate desperate gasps of air, the ironically innocent-sounding celeste at the climax of "Sexual Ax" and the mocking, tooting harmonica of "One More Look in Your Eye" – such touches are characteristic of the composer. "King Sting" rumbles around in the orchestra's lower registers for the most part, teasing brief tasters of the main theme before finally erupting into a furiously intense passage that's again underpinned by a complex tapestry of percussion. Towards the score's finale, the cryptically-titled "Love Anagram" initially promises a redemptive, beautiful end to the score but Young then violently pulls the rug out from under us with a final, savage burst of the killer's material. A choral glissando then dies away into the mysterious sound of the main theme in "The Lucky One", the composer again reinforcing the sense of those elusive urban legends that forever stay with us. Featuring a sepulchral, near-Gothic choral quality, it's an especially effective climax to the score. What's so galling is that such an exceptional score accompanies such an idiotic film (that the music in context is also embellished with tiresome 'jump' stingers is also a shame). 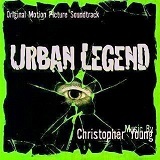 But just because Urban Legend the movie deserves to be consigned to the cinema dustbin doesn't mean that Young's score also has to. Like all great composers have done before him, Young steps up to the plate and delivers a score that frankly over-achieves, generating the vast majority of the movie's tension on his own. Wonderfully robust and old-fashioned in its execution, Urban Legend might not necessarily be one of Young's more ground-breaking horror efforts but it's far more sophisticated than the movie deserves. When faced with such deliciously spine-tingling results as this, it's hard to deny the composer's crown as the king of the horror soundtrack. Unfortunately, the full score is hard to come by. 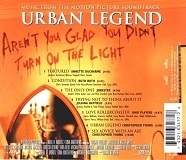 On the release of the film, a soundtrack album comprised of song cues from the movie and two cues of Young's ("Urban Legend" and "Sexual Advice with an Axe") was released. At the same time, a limited edition promo (reviewed here) was given a limited release. Occasionally, the promo is available on the secondary market albeit usually at a premium price. So it's worth trying an internet search or the following links for availability - Amazon.co.uk and Amazon.com.